Nairobi leads a list of 10 African cities in attracting foreign cash inflows especially in the real estate development. The just released study by real estate firm, JLL (Jones Lang LaSalle), says that Nairobi is favoured as the gateway to East Africa, outpacing Abuja city (Nigeria) and South Africa’s Johannesburg. Other cities whose real estate sector attracts notable cash inflows are Addis Ababa (Ethiopia), Dar-es-Salaam (Tanzania), Kampala (Uganda), Kigali (Rwanda), Lagos (Nigeria), Luanda (Angola), Lusaka (Zambia) and Mozambique’s capital Maputo. The study reveals that sustained economic growth and rising urban populations continue to generate the need for significant investment in office blocks, roads and residential houses. This signals Kenya’s entry into the high-growth period of development, the study says. 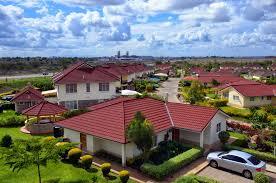 Digitisation of the Nairobi Land Registry is said to have eased land transactions, attracting investors. The city is also witnessing a new crop of middle income earners driving growth in the malls, luxury houses as well as hotel facilities by established foreign brands in various parts of Nairobi. The 32-paged JLL study, Emerging Beyond the Frontier, asserts that while political risks have a bearing on all investments in Kenya, a long-term view and formation of strong partnerships with Kenyan investors mitigates against the challenges. JLL’s chairman for Sub Saharan Africa Mr. Mark Bradford added that rapid rates of urbanization and burgeoning middle class has seen multinational corporations, hotel operators and investor groups take keen interest in the country with each seeking to find space in locations highly sought by the newly rich locals. Interest in Nairobi is driven by high returns on investments at the Nairobi Securities Exchange where recent introduction of Real Estate Investment Trusts (REITS) is seen as a safe bet for foreign investors seeking a share of the real estate pie. Nairobi bourse and the Nigeria Securities Exchange have also enjoyed new reputation as safe hubs for investment for foreign direct investments, creating an alternative financial hub to the South African bourse. Nairobi is also catching the attention of the world due to its growing interest in exploration of oil and gas as well as the vibrant information, communication and technology subsector.JLL’s Sub-Saharan Africa Capital Markets Director Anthony Lewis attributed the growing investments in Nairobi to tangible progress realised in political and economic governance.This, he said, has improved the business environment making developers to inject funds in modern commercial real estate development. The study observes that as competition for office and residential house developments reach fever pitch, Kenya could see foreign investors sink funds in other major towns such as Nakuru which are showing a “good appetite” for high-end investments in real estate. This entry was posted in Greenspan mall, Home Ownership in Kenya, News and events in Kenya real estate sector, Property developments, Property guide Kenya, Property in Kenya, Real estate Investments in Kenya. Bookmark the permalink.